Front row (left to right): 1. Bob Link, 2. Lonnie Podgorney, 3. George "Joe" Diaz, 4. Bob Cary, 5. Dan Hammett, 6. Joe Serpa, 7. Mike Segundo. Sitting between the front row and the second row: 1. Mike Mueller, 2. Greg Rosa, 3. Jimmy Gillette. Second row: 1. Robert Sheafer, 2. Neil Haera, 3. Mark Worth, 4. James Epps, 5. Robert Rumberger, 6. Darryl Schofield, 7. Phil Roark, 8. Phillip Johnson, 9. Dan Spruiell. Back row: 1. Ted Goad, 2. Douglas Wyatt, 3. Terry Meyers, 4. Albert Hansen, 5. Bruce Henry, 6. Craig Mueller, 7. Harold Lambaren, 8. Erwin Mueller, 9. Jon Pallito. Behind the back row: 1. Louie Mueller, 2. Dale Mueller, 3. Bud Critzer (head coach), 4. Jack Bonetti. Credits: From the collection of Bob Cary. 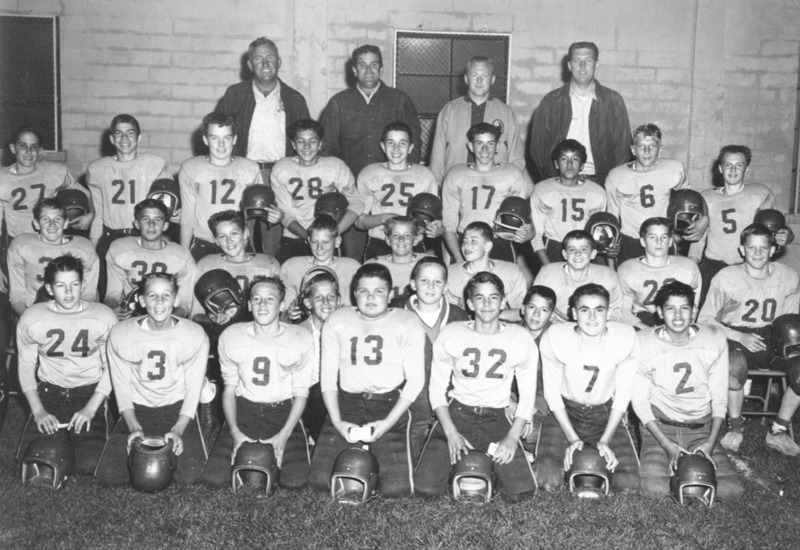 Thanks to Mike O'Brien and Bruce Henry for identifying the kids in the picture.